We’re sure you know that a bat is a heavy stick or club used in sports, such as baseball or cricket, and the related verb means ‘to strike with a bat’ or ‘to take your turn as a batter.’ In UK slang, a bat is speed or pace, although this sense is now dated. Unrelatedly, a bat is a nocturnal mammal that you also probably know. There are also a lot of idioms associated with bat; check them out below! Sonya swung the bat at the ball. Gary batted the ball hard. Ellie is batting at the moment. The car was speeding along the road at quite a bat. Bat, meaning ‘a stick or staff used to beat,’ ‘a war club’ or ‘a stick used to hit a ball in a game,’ dates back to the late 12th century. It can be traced back to the Old English word batt, meaning cudgel, which probably came from a Welsh or Celtic origin (in both Irish and Gaelic, bat or bata mean ‘cudgel or staff’). The Old English word was rarely used, but it was reinforced by the influence of the Old French batte (pestle), from the Late Latin battre (to beat). They can be traced back to the Proto-Indo-European bhat– (to strike). The paddle used to play cricket has been a bat since the early 18th century, and it morphed into the round bat used in baseball. The verb, meaning ‘to hit, beat or strike,’ comes from the noun, and dates back to the mid-15th century. It was first used in sports in the 18th century. 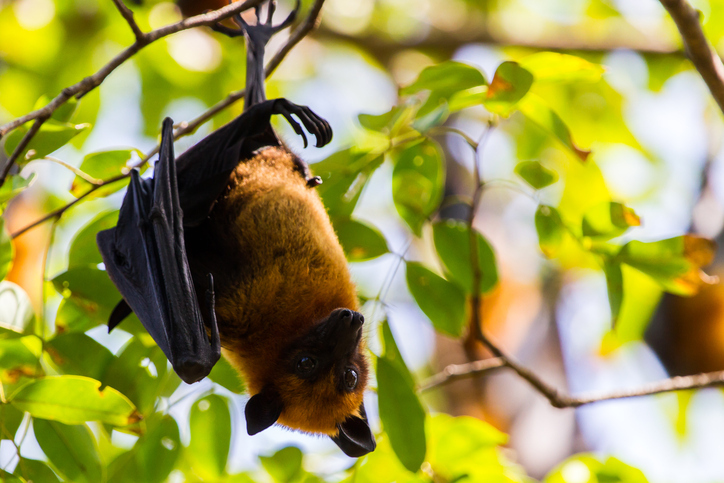 The unrelated noun bat, referring to the animal, dates back to the mid-16th century. It is an alteration of the Middle Englisk bakke (from the early 14th century), and probably came into English from a Scandinavian language. It is related to the Old Swedish natbakka and the Old Danish nathbakkæ, meaning ‘night bat,’ and the Old Norse leðrblaka (bat), literally ‘leather flapper.’ It can be traced back to the Proto-Germanic root blak-, form the Proto-Indo-European root bhlag- (to strike), and it is likely that the original name for the animal was something like “flapper.” Before this word came into English, a bat was called a hrermus in Old English (from hreran, ‘to shake’ and mus or ‘mouse’). It has also been known as rattle-mouse, flitter-mouse, flinder-mouse or flecker-mouse.